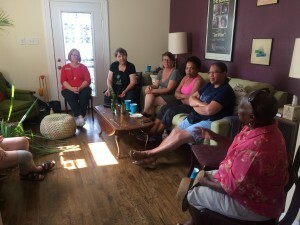 On May 19th, 2018 the Gentilly Community of Gardeners gathered once again, this time at Ms. Katie Carter’s house, a group member who has worked long and hard to get her garden up and running again after a natural disaster destroyed it. While we ate delicious cookies and drank homemade tea, Katie showed us her improved and expanded garden along with the Green Light Rain Barrel that provides the garden’s water. After visiting, we all settled in to learn from New Orleans Master Gardeners about the topic of propagation, an important technique for those who want to continue to grow their own plants without buying seeds or seedlings. Everyone learned something new, even those who had discovered many of the techniques on their own through trial and error. The best part about gathering periodically is not just the new skills we gain, but the opportunity to grow closer with neighbors of all ages and backgrounds and bond over a common interest. Everyone went home with vegetable seedlings and flowering plants to propagate. 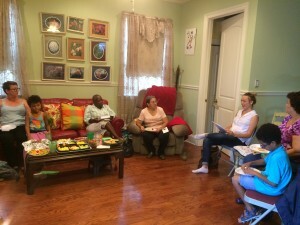 Lately we’ve been working on connecting neighborhood gardeners with each other to form local garden groups. By looking at a neighborhood and seeing where we’ve installed gardens, we can reach out to gardeners living close by each other and ask if they would like to be connected. This effort is part of Gren Light New Orleans’ “Tip the Block” program. As the gardeners out there know, having folks close by to share over-abundant harvests, seeds, resources and garden troubles with, is a great feeling. We’ve begun the process with a small group of gardeners in the Gentilly area. Read this article, where Peter Block explains, why small is important. Some members of this group have received their first service from Green Light in 2008! We’ve had a lot of fun getting this group in touch with each other, and meeting all of them ourselves. 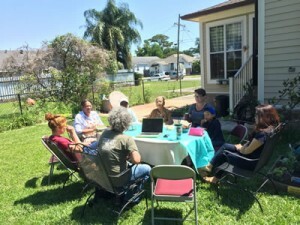 For their first gathering, the garden group met each other in spring 2017 in a neighborhood backyard and shared snacks, gardening stories, tips and resources. One topic was eating the food we grow in a healthy way. The other topic was rain barrels. Everybody admired Ms.Donna’s rain barrel and was wondering how they could get a rain barrel. 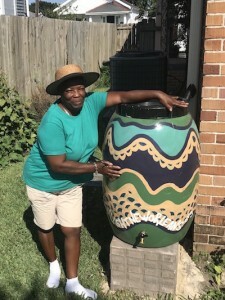 Find out more about the story of Donna Dunn’s rain barrel in this video! In July 2017 we all met again, this time with a guest, Danielle Shubert, a nutritionist speaker who talked to the group about the evolution of diet and effects of our modern food system on the population. The nutritionist also talked about what we can do to best eat healthfully in today’s world of modified and convenience foods. The gardeners outdid themselves with some delicious snacks, and we all had a great time learning and talking with each other despite the rain forcing us to stay inside. In keeping with the ancient tradition of sharing knowledge, food, and seeds the Gentilly gardeners gathered once again in November 2017 to discuss growing their garden within the climate context of urban New Orleans. There was no programming involved, only intentional conversation. We learned, in an organic way, about: the importance of composting and how to create different composting receptacles; what is growing well right now; how to deal with slugs and snails; the importance of attracting monarch butterflies and other pollinators; and how to propagate our grown plants and food bought from the grocery. In the end we all went home with some okra seeds harvested from our host, Donna Dunn’s, okra plant as well as asian-green mizuna seedlings, a broader knowledge on growing in the Fall in New Orleans, but perhaps most importantly, warm hearts and large smiles from an evening growing in community. We will continue to support the group with resources. Ms. Verda received her rain barrel in October 2017.